Here’s a quick and easy read. 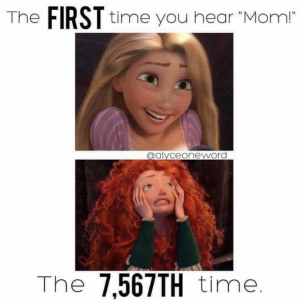 Memes are an amazing way to pause for 5 seconds and laugh. 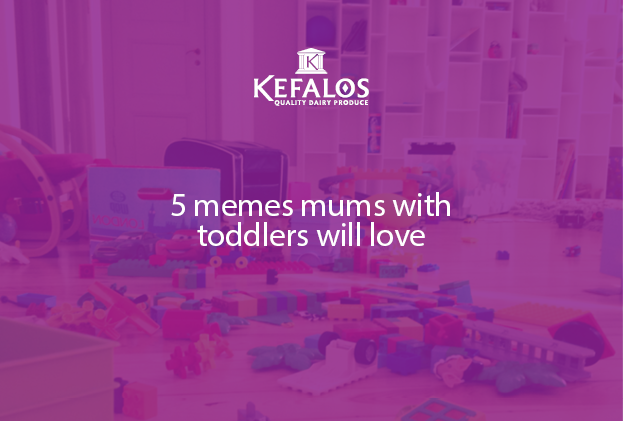 So here are 5 meme’s we know you will love if you have small kids. Even if your kids are grown you can read this and appreciate the journey you’ve been on. Remember the good ol’ days when all we had in our vocabulary was sounds and gestures. 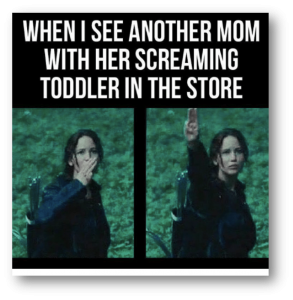 Now we have the classics “No!”, “Mine!” and the use of “Mum!” once every three seconds. They may seem tiring and frustrating now, but cherish these moments because once the kids are grown, they are gone forever. In life it’s so easy to want to compare what you have with everyone else’s. While that may be ok for your wardrobe it shouldn’t be the same for your little ones. Kids age and develop at different rates and aren’t in competition with each other (well for the most part). Remember not to judge the next person’s kids – and certainly don’t compete with them. Sometimes your daughter wants to go out in public in a blazing hot sweater in summer, with a pink tutu and blue wellingtons. Or it may be your little boy deciding to relieve himself in your friend’s pond. You just don’t know, so just be happy to see them grow and mature. So the story goes; Goldilocks walked into the three bears house unannounced without even sending a WhatsApp asking if the bears were home. She then proceeded to help herself to the bear’s porridge without a moment’s consideration. She tasted the first one, which was too hot. The second one was too cold, and the last one was just right. So she ate it. But why where there cold porridge on the table? And where were all the bears? 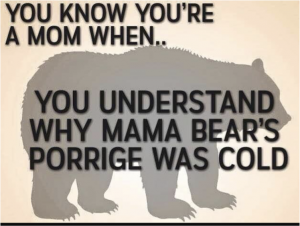 If you’re a mom you definitely know that the cold one belonged to the momma bear. It was cold because when she woke up to get things ready, grandma bear called to complain why little bear hadn’t been round to her house in weeks. Stressed out from that conversation she walked into her bedroom where poppa bear was on his phone. She dreaded telling him that he was going to have to cancel his catch-up with his mates because “now we’re going to grandma’s”. Poppa bear naturally starts to complain, which of course wakes up little bear, who comes knocking at the door. Momma bear has to deal with little bear because poppa bear is now throwing a full-on “mantrum”. She takes little bear into the kitchen to make porridge for breakfast. When the porridge is done, she puts it into three bowls and goes to call poppa bear, who is still growling. Minutes go by and momma and poppa bear have finally agreed on the terms and conditions of going to see grandma and grandpa. By then, the porridge has gone cold and little bear is now asking for the potty. Momma bear tells poppa bear to reheat the porridge in the microwave while she changes the little one. He puts his in first and almost re-cooks it. Realising he doesn’t know what he’s doing he shouts to momma bear for the correct time to heat the porridge (which is what he should have done in the first place). With the proper instructions he heats little bear’s porridge to perfection. Before he gets to momma’s porridge he hears his phone and rushes to get it. And that’s probably when Goldilocks walked in to find three bowls of porridge unattended. Last one is not a meme but we had to include it. Enjoy this brief, hilarious video from the Gardner Quad Squad. 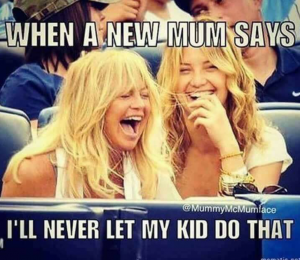 Sometimes all you want as a mum is a treat you dont have to share.